Discover new teaching practices and refresh your pedagogy with these short videos aimed to give introductions to new or modernized teaching ideas, strategies, and social studies skills. Released monthly, the videos will range in topics such as introductions to primary source instruction to literacy practices in the social studies. Watch this page, Facebook, or subscribe to the e-Newsletter for new videos. Census records are a treasure trove of historical information. Once you learn where to find census records and how to analyze them, you can learn about subjects such as immigration, families, and change over time. Newspapers can tell us so much about local, national and international news, but there's so much text, how do we know where to start? Get some helpful hints about effectively using newspapers with students. Photographs are a great entry point into primary sources, and can appeal to young learners, ELL students, and struggling readers. Get tips for finding photographs online and tips for classroom use. Objects tell amazing stories! Learn about ways that you can incorporate objects into classroom instruction to more deeply engage your students in the past. Learn why to use multiple and diverse texts. Explore how to use sourcing, corroboration, and contextualization. Practice "interrogating" a text with a poem, artifact, painting, photograph, government source, portrait, and infographic. Critique diverse texts such as a painting, quotes, census data, campaign commercials, books (secondary sources), picture book, and TED talk. Use the CAPP strategy with texts, and DBQs to corroborate multiple texts. Segment 1: Why is LIteracy Important in Social Studies? Understand why reading and writing are important in social studies. Learn new strategies for helping students learn social studies through text. Learn about the difference between chronology and timeline focusing on chronology in the classroom. Segment 3: What is Six Degrees of Separation? Learn about a fun, interactive teaching strategy to gauge student understanding of historical causation and change over time. Encourage discussion, debate, and student voice in the classroom. Segment 1: What is Concept-Based Learning? Concept-based learning helps students focus on "life's big ideas" which are applicable to other situations. Learn why concept-based learning is important and how concepts differ from knowledge and skills. Concepts should drive curriculum, instruction, and assesment. Walk through examples of a concept-based unit plan, lesson, and assessment that you can use in your classroom. African Americans made up a small percentage of early Minnesota's population, but that small population played important roles in the territorial and early statehood years.Watch this recorded one-hour webinar discussing the lives and contributions of Minnesota's earliest black residents. In this 60-minute webinar, you will be introduced to (and practice using!) a sketch map, economic decision-making process, primary source analysis, and civic engagement. 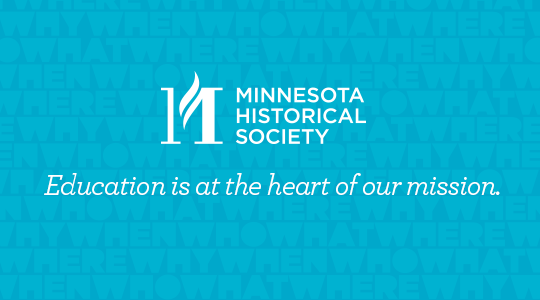 Join the Minnesota Historical Society and Ford's Theatre for a one-hour webinar as we examine the impact of the Lincoln assassination and the end of the Civil War on the American public, and in particular on Minnesotans.